Since 2000, the Ipe Clip® Fastener Company (DBA DeckWise®) has manufactured high quality Made in the USA hidden deck fasteners for exotic hardwoods and composite deck building. With a proven track record of extraordinary customer satisfaction, our deck building products are comprised of high-grade long-lasting materials. Every product is expertly engineered to withstand corrosive weather elements from the desert; to the tropics; to the cold. Ipe Clip® hidden deck fasteners eliminate many common decking problems such as cupping and warping. This is due to only 1 side of the deck board being pinned down to the framing. This allows decking material to move naturally all the while keeping consistent board gaps. By offering a wide variety of decking products, DeckWise® covers the industry as a leading go-to supplier. Products such as the Hardwood Wrench™, Ipe Oil®, WiseCoat®, Ipe Seal®, deck screws, hardwood deck tiles, and pedestals plus essential decking tools and accessories, we’ve got you covered. Every year that goes by has brought extensive LBM product growth. 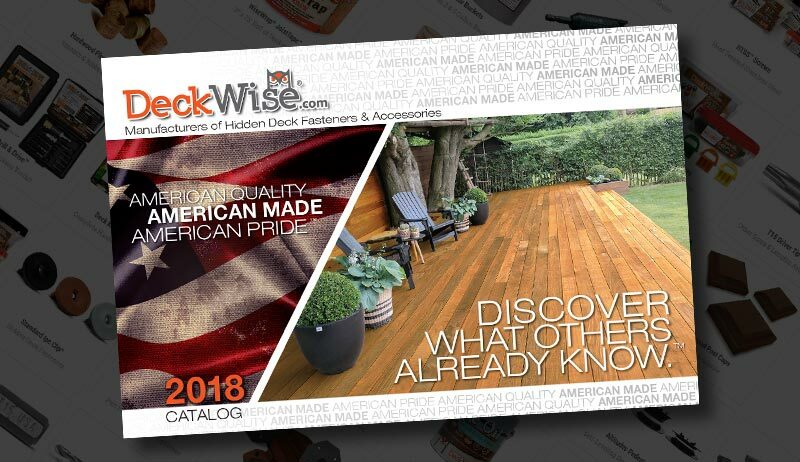 With each innovative product that is brought to the market, DeckWise® continues to expand our U.S. and European network of dealers and distributors. Our #1 goal is to provide DIY homeowners, architects and Pro contractors with the best deck fasteners, wood finishes, hand tools and accessories on the market. With most hardwood deck fasteners on the market at the time being met with poor reviews and customer complaints, the need for a quality deck fastener was apparent. The first Ipe Clip® hidden deck fastener is developed and tested to show that a deck fastener/clip could withstand the harshest of applications, most dense wood and climate changes. The soon-to-be Ipe Clip Fastener Co, LLC, applied for their first of many patents with the United States Patent and Trademark Office. The Ipe Clip® Fastener Company is born and has its first sales with astounding reviews. Finally, the hardwood market has a hidden deck fastener that can deliver on its promise of quality, strength, and longevity. Sales grow dramatically as deck builders and DIY homeowners rave about the easy installation and superior hold-down strength of the Ipe Clip® hidden deck fastener. Ipe Clip® expands its distribution network and grows to become a worldwide brand. International distributors start to inquire about carrying and promoting the product. While Ipe Clip® deck fasteners are quickly becoming the top choice of contractors and home owners alike; the desire to improve and expand the product line still exists. Development and testing begins for air-dried hardwood deck fasteners; the Ipe Clip® Extreme®. The Ipe Clip® Extreme® is released and the feedback is nothing short of amazing. The polymer molded fasteners now have a stainless steel insert adding up to 3X the strength over other brands. The general consensus from deck building experts is, that, the Ipe Clip® Fastener Company delivered what every deck builder dreamed about. It’s as close to a perfect fastener as anyone could achieve. Astonishing increases in sales promptly followed. Ipe Clip® ExtremeKD® was developed and released to help fill the need to properly fasten kiln-dried hardwood lumber. This fastener also solved the problems many contractors faced with composite decking, especially with ¼” gap spacing and the “mushrooming” effect caused by face screwing. The Extreme® family of fasteners has surpassed even the hopes and projections of the Ipe Clip® Fastener Company; they have already become much more popular than the Standard Ipe Clip® fastener that was released just six years ago. In an effort to keep up with demand, the Ipe Clip® Fastener Company expands to a larger facility in South Carolina. Their new warehouse is over 10 times larger than the previous one, which signifies a major growth spurt for such a young company. Product research and development begins on new deck tools and accessories which will pave the way for what is expected to be a booming 2009. It would appear that all the research done in 2008 had really paid off; three new products are unveiled to the decking industry. First, the Hardwood Wrench™ steals the spotlight at the International Builders Show. Builders, contractors, and engineers all rave at the clip design and power of this new board straightening tool. Ipe Oil® hardwood deck finish is the next product to be released. Its ability to soak into hardwoods such as Ipe makes it an easy choice for deck builders and DIY home owners when it came to protecting their decks. Finally, with Extreme Plugs®, countersinking screws is easier than ever. Tolerance absorbing rings cut into the plugs were an industry first and solved a major problem that most builders had when it came to traditional wood plugs. It came as no surprise to anyone, that, the folks at the Ipe Clip® Fastener Company were continuing to introduce innovative solutions and products to the marketplace. Ipe Clip® Extreme4® is officially introduced into the market as the best hidden deck fastener. It is designed to work perfectly with air-dried decking, kiln-dried hardwoods, and both composite and PVC decking materials. This fastener not only works well with most decking materials - which is by far its most appealing characteristic - but when it’s added to the already well known Extreme® family of fasteners, builders finally have a choice between which fastener to use and what gap spacing they desire. Spurred by continued growth, the Ipe Clip® Fastener Co, LLC moves to a new 70,000 s.f. facility in Bradenton Florida. New machinery is purchased for manufacturing more fasteners, more wrenches and now the steel inserts are coated with black oxide to assist with hiding the fastener screw heads in between gaps. More new products are unleashed such as the introduction of the Deck Tile Connector System and the new Drill & Drive™ 3-in-1 interchangeable drill bit and drive head for faster fastener installations. Deck board gap spacers and hidden hardwood siding fasteners soon followed. The Ipe Clip® Fastener Co., LLC, changes its’ name to better service the decking industry with a packed portfolio of products. Branded in the US as DeckWise®, and internationally as DeckWise® B.V., an entire new corporate ID was hatched through many new marketing efforts including the new website at www.DeckWise.com. Under the mantra “Smart Solutions For Tough Decks®,” we strive to be a one-stop-shop around the globe. DeckWise® continues to be innovative in the decking industry always exploring new ways to make stronger, longer-lasting decks. This year the addition of new decking screw lines thrust the company further ahead as a leader. The reason why we have enjoyed such success is because of the great partnerships we have created by our network of distributors. 2014 ushers in more new product ideas and concepts that will surely beam brightly in the years to come. By creating the most innovative decking products on the market today, and by ensuring that our distributors have access to these products in a fast and efficient manner, DeckWise® is here to stay... and grow. We just keep on growing! This year we expanded our 75,000 sq.ft. warehouse to house numerous new products. We saw a increase in the use of metal joists for framing. We stepped up and now offer a self-tapping deck screw designed to easily penetrate metal deck framing. We also noticed the lack of an all-in-one hardwood restoration kit on the market. So we made one! Our Hardwood Restoration-Maintenance Kit provides home owners every tool and product they need to restore and protect their exotic hardwood deck, outdoor furniture, hardwood siding and basically any type of hardwood application. Continuously looking to improve efficiency, this year we added a few more tools we felt no deck builder should be without. Want to groove lumber onsite? Now installers can with the DeckWise® 4-wing carbide tip router bit. It can be used with either a handheld or table router. Another addition is the handy Premium Hardwood Plug Cutter. Attach to a drill press or cordless drill and instantly cut those last few hardwood plugs on the job site. Our engineers have been working hard these last few years researching, developing and perfecting a pedestal system for hardwood deck tiles. The result is the Altitudes Pedestal® System which was unveiled at the IBS Show in Orlando, Florida this year. Now, underutilized sloped roof tops, plazas and bare concrete patios can be transformed into beautifully level outdoor living spaces with exotic hardwood deck tiles. Always out-doing ourselves we are also offering stainless steel cable railing kits which also made their debut this year in Orlando. Ready-to-Install WiseRail® decking cable rail kits are packaged in pre-measured 5 ft. to 50 ft. lengths and include all stainless steel fittings. As we continue to grow, DeckWise® continues to be a front runner in the deck building industry. Our team at DeckWise® understands that with the many decking products now available, the purchasing options can be overwhelming. The majority of products claim to work with all decking materials yet, are unable to back up that claim and often end up failing miserably. And, when the incorrect deck tools are used, the overall look and performance of a deck can be negatively affected. That’s why DeckWise® uses attention to detail and focus to create our high-performance hidden deck fasteners. Because of this, and our top-of-the-line machinery, our products are developed to excel with all types of decking materials, even under the most stressful climates. Thank you for purchasing Ipe Clip® brand hidden deck fasteners. We are confident you will be happy with the quality and performance of our products and we are proud to offer to the original purchaser a limited lifetime warranty. Please refer to our terms and conditions for details. Ipe Clip® Hidden Deck Fasteners warranties its fasteners to be free of defects in material and workmanship for lifetime in accordance to terms. This will cover material defects resulting in failure of the fasteners for residential and commercial applications. This warranty does not cover damages from improper installation, abuse, alteration, disasters, misuse and treatment in manner other than as intended. Warrantor’s lone obligation is limited to replacement of the Ipe Clip® fasteners and Warrantor shall have no further liability or obligation except as purposely stated in this document. This warranty does not cover costs of removal, installation, reinstallation, decking materials, installation tools, and assumes no loss of use, liability for incidental or consequential damages. Failure to follow the instructions, requirements and recommendations or warnings provided with Ipe Clip® Hidden Deck Fasteners shall make the warranty invalid. Ipe Clip® Hidden Deck Fasteners reserves the right to investigate any claim. Decking applications using this product must comply with all local zoning and/or building codes. Ipe Clip® Hidden Deck Fasteners does not assume any risk or liability associated with the use of the Ipe Clip® products. Wearing proper safety equipment and other necessary precautions should be taken to ensure the safety of everyone involved in the project. To be eligible to make a warranty claim you must have completed the warranty registration here on the website. Prepare a letter with the following information for replacement product: online warranty registration card properly registered within 60 days of purchase (can be printed and mailed or faxed), proof of purchase (copy of receipt) with location and date of purchase, reason for claim and quantity and model # of fasteners. Please e-mail us, contact us or fax to 864-902-8817. With most products manufactured in our state-of-the-art Florida manufacturing facility, DeckWise® produces premium long-lasting materials specifically designed to solve the problems deck builders across the globe face every day.